Accidently delete files from USB drive? Format an USB without backing up your files? Don't worry, the files in the USB are not permanently lost. Here is smart USB data recovery solution to help you recover lost files from USB drive. How to Recover Files from USB Drive? Data misplaced or deleted from USB drive is an original quandary. Your USB drive pressure is regular use, it obtained damaged or corruption will likely happen. However, USB drive is the most preferred storage gadget to store your primary records, pictures, and others. All these records shall be misplaced brought about through by accident deletion or formatting, procedure failure, gadget corruption and virus attack. That you can get a powerful USB data healing instrument to get better records from USB. In order to recover lost files from USB drive, you need USB data recovery software. The software must be powerful and easy to use so that you can easily recover all lost files from USB drive due to deleting, formatting, virus infection, USB crash, and other reasons. Free download and install DiskGenius USB data recovery software on your computer – this is powerful yet easy-to-use data recovery software. This article presents the step by step guide with DiskGenius USB data recovery software. Just follow the steps below, you can recover all files from any brand of USB flash drive. Step 1 Connect the USB drive with your computer. Now, connect the USB drive with your computer via USB cable. And then run DiskGenius on your computer. It will automatically recognize and list the USB drive. Then choose the USB drive on the main interface. Step 2 Scan the USB drive to find lost files. Click "File Recovery" and "Start" to scan the USB drive to find all lost files. DiskGenius offers deep scan to scan the USB drive to ensure finding every recoverable file. Step 3 Preview and recover your files back. In order to prevent the lost files in the USB from being overwritten by new files, please don't create or put new files to the USB drive before you recover all lost files. And please save the recovered files to your computer before you complete all recovery. If you can't find all lost files inside the USB drive after a first scan, just reconnect the USB drive with your computer and scan it again. 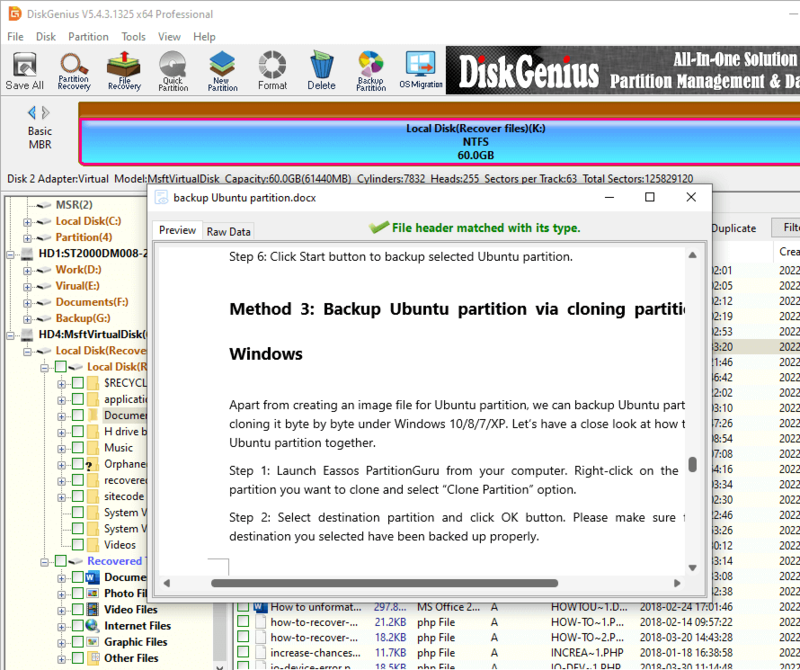 Recovering files with DiskGenius is the easy and quick way to recover files from USB drive. Besides recovering deleted/formatted files from USB drive, DiskGenius USB data recovery software even can help you recover lost files from damaged, corrupted or inaccessible USB drive. Just download/install it, and run it to scan the USB drive, you can completely get deleted or lost files back!